WASHINGTON – The White House seethes with intrigue and backstabbing as aides hunt for the anonymous Deep (state) Throat among them. A president feels besieged by tormentors — Bob Woodward is driving him crazy — so he tends his version of an enemies list, wondering aloud if he should rid himself of his attorney general or the special prosecutor or both. Nearly every element in Trump's trouble has a Watergate parallel. President Richard Nixon first ordered his attorney general, and then the deputy, to fire the Watergate special prosecutor; they refused and quit on a convulsive weekend that gave history the Saturday Night Massacre but did not derail the independent investigation or Nixon's collapse for long. Trump, for his part, fired the acting attorney general as well as FBI Director James Comey, triggering the Mueller investigation that has dogged him for more than a year. Some of the same reporters are causing the president's pique. It was Woodward and Carl Bernstein, the reporters who uncovered the Watergate break-in, getting under the president's skin once again. "Dem operative," Trump fumed about Woodward. "Degenerate fool," he said of Bernstein, who helped report a CNN Russia-probe related story that Trump contends is "a major lie." "Everybody's trying to get me," Trump told an aide, according to the new Woodward book, "Fear." The book describes a tragi-comedy inside the White House with top aides dismissing the president as an "idiot." In Nixon's time, top lieutenant Henry Kissinger called his boss "meatball mind" behind his back. "This is a president who says things publicly that we know from the tapes that Nixon said privately," says Timothy Naftali, a New York University historian who directed the Richard Nixon Presidential Library and Museum. "It's as if Trump is wrestling with the history of Watergate openly. It's the president who is inviting these parallels." Trump's list of those he considers enemies is obvious on his Twitter feed. It includes former political opponents, his own attorney general, his predecessor and former national security officials, whose security clearances he's threatened. Now he's added an anonymous senior official who authored a New York Times op-ed describing the president as amoral. The aide described a "steady state" within the administration working to temper Trump's erratic impulses – a portrait just a degree away from the "deep state" Trump says is resisting his policies. Trump said Friday he thinks the Justice Department should investigate the unnamed official's identity. In Nixon's time, on Aug. 16, 1971, a White House memo laid out thoughts about "how we can use the available federal machinery to screw our political enemies." Prosecution, litigation and the withholding of grants and contracts were considered and Nixon loyalists were asked to contribute names to the list. Nixon's enemies list was written by Dean, the lawyer-fixer who abandoned loyalty to Nixon and helped bring down his presidency. Democrats asked Dean to appear at the Senate's Supreme Court hearings as an expert of executive power. He presented himself as an older and wiser man. "There is much to fear from an unchecked president who is inclined to abuse his powers," Dean told senators. "That is a fact I can attest to from personal experience." As counsel to the president, Dean arranged hush money to the Watergate burglars who tried to find material helpful to Nixon's 1972 re-election at Democratic offices in the Watergate complex. 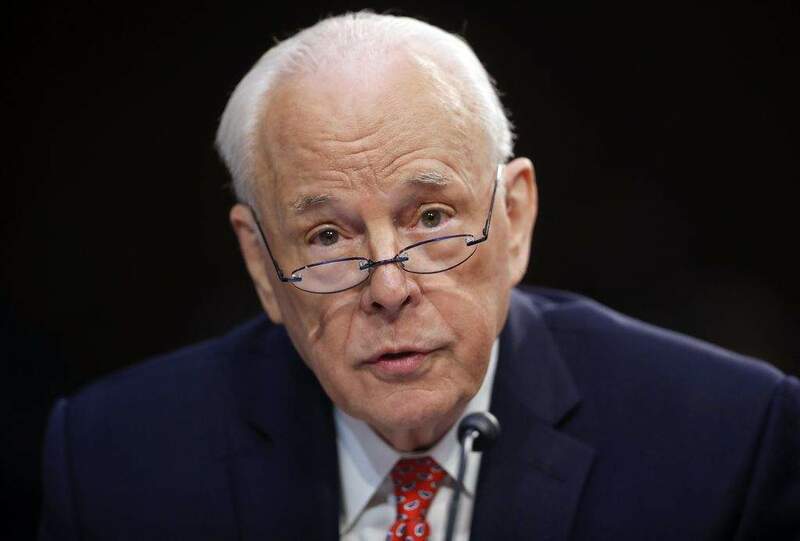 Dean participated broadly in the cover-up of Nixon's culpability before breaking with the president and delivering devastating testimony to the Senate Watergate committee. He served four months for obstruction of justice; Nixon resigned from office under threat of being removed by impeachment. Dean's loose counterpart today: Michael Cohen, who as Trump's personal lawyer arranged hush money to women alleged to have had affairs with Trump. Or perhaps Dean's equivalent is Don McGahn, the White House counsel who has cooperated with investigators and sat for hours of interviews. It's not yet clear whether McGahn gave up material damaging to the president. Trump is not accused of any crime and the series of convictions Mueller has achieved against Trump campaign aides has not unearthed collusion between Moscow and the campaign. There's no smoking gun. Yet "Nixon's playbook for dirty tricks and abuse of power and political espionage is a useful source of questions for any investigation of an impulsive, erratic and potentially criminal presidency," he said. "We'll be watching. The Nixon presidency makes us smarter as we try to make sure that our presidents don't do what Nixon did."